The nurse managed to stop the bus when it went out of control and then started CPR on the driver. A NURSE WHO intervened when a Dublin Bus driver took ill and the vehicle veered into traffic in the city centre has said she is grateful she was there to help. 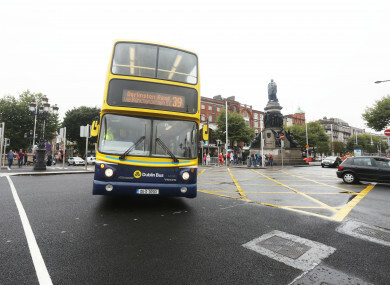 Aoife McGivney was on her way to work at the Mater Hospital when she noticed the bus veering off track and other passengers “started screaming”. “We were going through red lights, there were cars beeping and we actually ran over a bicycle, which was quite frightening at the time,” she told RTÉ’s Ryan Tubridy this morning. The bus had knocked a cyclist off his bicycle but he managed to jump out of the way before the bus drove over it. He suffered only minor injuries. McGivney ran to the front of the bus where another woman told her there was something wrong with the driver. He was unconscious and his breathing was “very poor”. At this stage the bus was approaching O’Connell Bridge and she said people on the street were running alongside the bus, trying to see what was wrong. McGivney and the other passenger managed to open the driver’s door and she said she moved his legs to get his feet off the pedals. The bus cut out and rolled to a stop. After putting the driver in the recovery position she said she noticed his breathing and heart had stopped. With the help of some other passengers with first aid training, she started CPR. The nurse said she was told by paramedics who took the man to hospital that he was up and talking by the time the ambulance left the scene. She said she planned to visit him today. She said she wanted to highlight the importance of first aid training so members of the public can “recognise when someone is that sick and when it’s time to intervene”. McGivney, who had almost missed the bus that morning, said she is “grateful” that she was able to be there. Email “Nurse who saved unconscious bus driver describes 'frightening' ordeal for passengers ”. Feedback on “Nurse who saved unconscious bus driver describes 'frightening' ordeal for passengers ”.